Like many of you have properly observed, your photo library is getting out of control. Every year, you seem to be taking more pictures than the one before and, oh by the way, the resolution of your cameras (point ’n shoot, cell phone, etc.) is getting higher and higher too. Between 1996 and 2002, photo sizes were basically flat at 0.15 MB per picture. Starting with 2003, the average image size increased by 58% on average annually (from 0.15 MB to ~3 MB per picture; and I’m not using super high-tech cameras, otherwise the sizes would be significantly higher)! 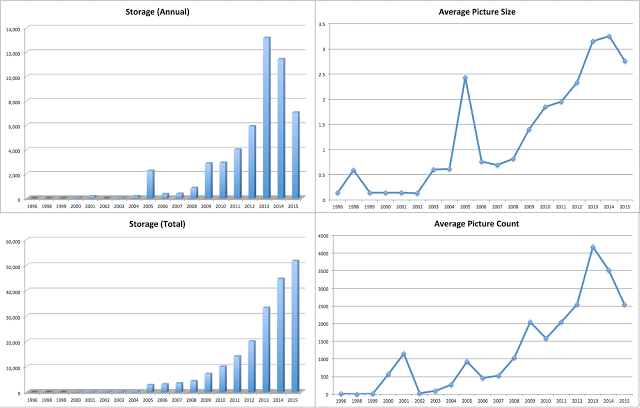 Over the last 10 years, the average count of pictures taken per year increased by 41% annually! Bottom line: total storage space required for pictures is growing exponentially. Although the number of pictures one can take per day is probably going to top out somewhere (hopefully somewhere below 1 picture for every minute of the day! ), the resolution will keep climbing, at least for a while. Where does all this leave us? I believe that ultimately the solution will be to store all these pictures not on your hard drive, but in the cloud. Photo management software will eventually need to adjust and store only a subset of your library on your drive, maybe in the form of thumbnails and meta data (Apple’s new Photos app is already moving in this direction). For viewing and editing of your pictures, the originals would then have to be downloaded on the fly. All of this not only requires a fast internet connection, but also trustworthy, reliable and affordable online storage. At the end of the day, few us will be able to store our own photo libraries on our own systems any more. The software (and storage) vendors will have the challenge to make this experience seamless and reliable. But in the end, that’s probably the only way to make photo storage sustainable.